An expert speaker recently came to our headquarters to speak about one idea for improving everyone’s health and wellbeing: mindfulness meditation. What is mindfulness meditation anyway? If you haven’t been exposed to the concept or the buzz surrounding it, you might be a little confused about what it is and how it relates to wellness. And it’s more than just sitting cross legged and saying “om”—the image that comes to mind for many of us when we hear about meditation. It sounds simple, but the effects of practicing mindfulness meditation are plentiful. By re-training your mind to stay present and calm in the moment, mindfulness meditation changes the physical structure of your brain, creating long-lasting changes and positive, healthy habits. Mindfulness-Based Stress Reduction has been scientifically shown to help with depression, anxiety, addiction, and even slow the aging of the brain. 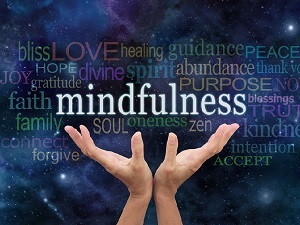 Lafler distinguished between “mindfulness” and “meditation.” She pointed out that mindfulness is merely paying attention, being aware, and observing the present moment in a non-judgmental way. Meditation, on the other hand, is simply a tool to increase mindfulness. Lafler explained that the brain is like a cage of screaming animals because our mind is constantly thinking. She encourages everyone to practice meditation as a way of observing this phenomenon, because doing so can reduce the amount of time negative feelings or emotions can dictate your mood and mental wellbeing. What Lafler said about the positive impact of meditation isn’t a just hope or theory. A team of researchers found that 95% of participants found relief from their stress-based symptoms after practicing mindfullness meditation. If you take a moment to Google “mindfulness meditation” with your community name, odds are you’ll find at least one organization that offers meditation sessions. Often you can even participate without signing up in advance, as many places offer drop-in sessions to try it out for little or no cost, making it an easy wellness change you can make. If there isn’t a group where you live, maybe let technology lend a hand—participate in a meditation session over livestream, such as the one offered at Madison’s Monona Terrace, or download some guided meditation sessions, or go old-school and pick up a CD or two. “Mindfulness and meditation is a tactic, but one you can use all day every day,” says Lafler.